The 6.8 SPC was developed as a coalition between the US Army and Remington as they strove to provide a round that was in between the power and energy of the 7.62 and the speed and light weight of the 5.56. With these new rounds, you have everything you need for hunting, self defense, and match competing. Since 1982, Corbon has been producing premium ammunition that has a reputation for being of the highest quality and extremely reliable. 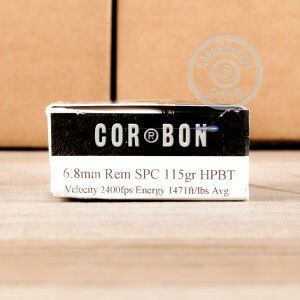 Corbon proudly makes all their ammo in the United States using only the newest and state of the art loading equipment. These Performance Match rounds are designed to deliver unmatched accuracy and consistency. Each round features a 115 grain hollow point boat tail projectile that leaves the barrel around 2,400 feet per second. 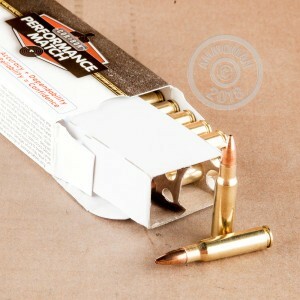 With these Performance Match rounds, you have some of the most accurate ammo available for your 6.8 SPC rifle. Stock up and save on the shipping. At AmmoMan.com all orders over $99 will ship for FREE!